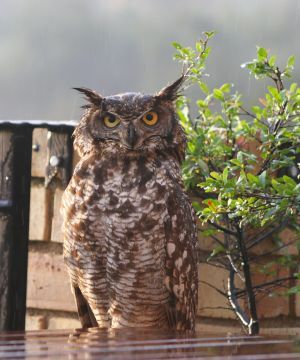 In August 2008 in the densely populated metropolis of Johannesburg, South Africa, a Spotted Eagle Owl in search of a nest site settled into a large pot on a balcony. The pot she chose was filled with soil and although she had to share the pot with the small tree growing in it, there was room enough for them both as well as her future family. Unbeknownst to the owl, she had selected the balcony of wildlife enthusiasts Tracy and Allan Eccles. The owl family was given privacy and Pot Plant Owl, as she was affectionately named, and Pappa, her mate, successfully raised a family of two in that first year. Since then they have returned to the pot to nest year after year. The owls have also accepted the webcam that broadcasts their intimate family life to hundreds of thousands viewers around the world. Pot Plant Owl's popularity has revealed intimate details of breeding behavior to an adoring public, but this popularity has had an amazing side effect. In 2009 when developers began to remove the trees in the only remaining wetland in the area, Tracy and Allan were able to get the development stopped thanks to a petition with over 27,000 signatures from around the world. Although the decision was appealed by the developers, Pot Plant owl won out and the wetland will not be developed. In a country where owl superstitions abound and witch doctors make medicines from owls, education is crucial to stop the persecution of owls. Pot Plant Owl's story can touch nearly any heart, so Tracy and Allan are frequently asked to speak at schools, society groups and organizations, and corporate functions to help educate children and adults alike about owl conservation and dispel myths. Tracy has written an award-winning book about Pot Plant Owl, and proceeds from the book sales are used to support Bird Life South Africa, FreeMe Wildlife Rehabilitation Centre and the Endangered Wildlife Trust. Denver Holt didn't want to be one of those researchers who works in the field while earning his degrees and then sits behind a desk the rest of his career. He was frustrated with "long-term studies" that were only two to three years long. He wanted to be in the field doing decades-long research on owls his whole career. 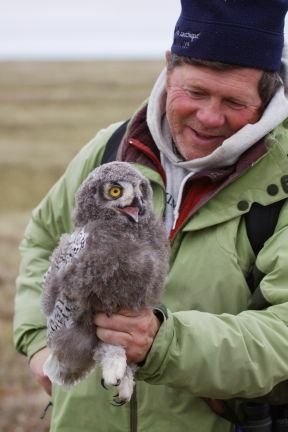 So he founded the Owl Research Institute near Charlo, Montana and has been living his dream for 30 years with no signs of slowing down. It's impressive enough to say that Denver has studied most of the owl species in North America, including 20 years working with Snowy Owls in the harsh climate of Barrow, Alaska and 25 years working with Long-eared Owls. He has authored dozens of scientific papers about owls. But he would not have received this award if all he did was research. Along the way Denver realized that research was useless unless the results made their way to the general public…the people with voting power and money to donate to causes. He has a phenomenal talent for sharing his passion and knowledge with people of all ages through educational programs in the field, children's books, as a keynote speaker all over the country, and through various media ranging from National Geographic Explorer and Magazine to Frozen Planet to Life of Birds to the New York Times and Disney. Thinking outside the box has become an important skill for Denver. While most researchers work from grant to grant, Denver has also cultivated a core of private individuals and foundations to fund the Owl Research Institute's work. Out-of-the-box thinking was also essential to solve the dilemma of Snowy Owls being shot in Alaska. An international treaty allowed this shooting for subsistence purposes by any resident of Alaska. Instead of fighting the problem, Denver worked with Inupiat leaders and asked them to voluntarily stop the shooting of owls on their land. His novel approach has curbed the bulk of the problem. With their unique appeal to the general public and their position on the food chain as top predators, Denver Holt plans to keep using owls as the face for environmental health issues. The most basic element of studying and conserving owls is knowing which species is which. This may seem like a simple concept, but in reality it can be a very complex affair to sort through closely related owls to discern which are subspecies and which are full species. While all species were originally classified based on their outward characteristics, this job is now done in the lab by analyzing DNA. 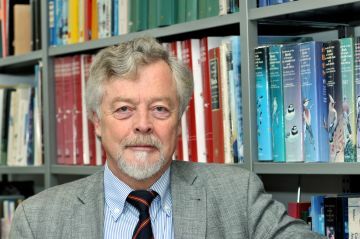 Prof. Dr. Michael Wink has analyzed samples of most of the world's owl species, making him the world authority on owl molecular taxonomy and systematics. His work provides a clear framework for future owl conservation and research, since correctly classifying species is of the utmost importance when appealing to governments to save and protect extremely rare species. Consequences of his research include reclassification of the Snowy Owl which is no longer in a genus of its own but has been merged into the genus Bubo as Bubo scandiacus. The former genus Otus has been split into Ptilopsis (Africa), Megascops (New World Screech-Owls), Psiloscops flammeus (North America), while the Old World Scops Owls remain in the genus Otus. Within the genera Tyto, Ninox, Athene, Megascops, Ptilopsis, Bubo and Glaucidium, DNA analysis gave evidence for the existence of new species or for splits. Molly and McGee became household names when the Associated Press got wind of the Barn Owl cam Carlos and Donna Royal were running in the back yard of their San Marcos, California home in 2010. But that was never how it was intended to be. Carlos and Donna had set up the webcam with the help of their grandson Austin so their friends and relatives could watch the Barn Owls nest in their yard. They posted the live video stream of the owls they had named "Molly and McGee" to Ustream and before they knew what had happened, 21 million "friends and relatives" from 102 countries had tuned in. Demand from the viewers was intense. They had questions about Barn Owl biology. Requests for more cameras and different camera angles. School classrooms wanted to talk to them via Skype. Moderators were needed for the chat rooms. Books, CDs, and other merchandise were requested. The Royals rose to the occasion and dedicated their entire lives to the Barn Owl cam, even cancelling a vacation to broadcast a second brood. International media coverage fueled the fire and more and more people around the globe developed MOD (Molly Obsessive Disorder.) But after the second brood fledged, the Royals decided to take the cameras offline so they could have their lives back. As Senegalese poet and naturalist Baba Dioum said, "In the end, we will only conserve what we love. We will only love what we understand. We will only understand what we are taught." Thanks to Carlos and Donna, millions of people all over the world love Barn Owls, which is a great thing for conservation.